Wrocław. Turns out I’ve been pronouncing it completely wrøng. I was giving it something like ‘rock-law’. The little bar through the ‘L’ (which I now know means that the consonant is velarized) means the pronunciation should be something like ‘vroucksluof‘ – although I have heard a few variations from people who should know. There you go. A little lesson in Polish. ‘Thank you’ is pronounced jenkooyeh and ‘I don’t speak Polish’ is nee-yah moo-vee-yah popolskoo, which should cover pretty much anything else. I’m at the field by 8am for the mixed team action. My hotel, one of three official ones, contains the Columbian, Indian and Polish teams (and some drunken tennis players). The mood on the bus is thrumming, excited. I haven’t picked up my hideous green ‘TV’ bib today, and I hope no one will notice. I may be in the ‘media’, but I don’t need to be marked out quite that badly. “Well… it went… but… it didn’t happen.” Everyone looks at their feet. Larry answers: “Yeah, but it’s possibly not the right time.” He slumps in his chair a bit. Lloyd Brown looks at me like I’ve just trodden in something. This isn’t happening. I consider abandoning it right here and running down the field. No, that would be worse, wouldn’t it? Wimping out of a difficult ‘interview’? Best course of action is to clumsily plough right on, right? Eventually Naomi Folkard takes pity on me and answers my set of questions about what happens to people when they get knocked out (they stay till the end, cos there’s no refund on the flights), sightseeing in strange countries, why she puts talcum powder under her chin, and what she puts on the top of her tab to build it up (Plumber’s Mait). I leave them my card and get out of there. Note to self: leave any sportsmen at least a week after they get knocked out of anything before trying to get any questions out of them. 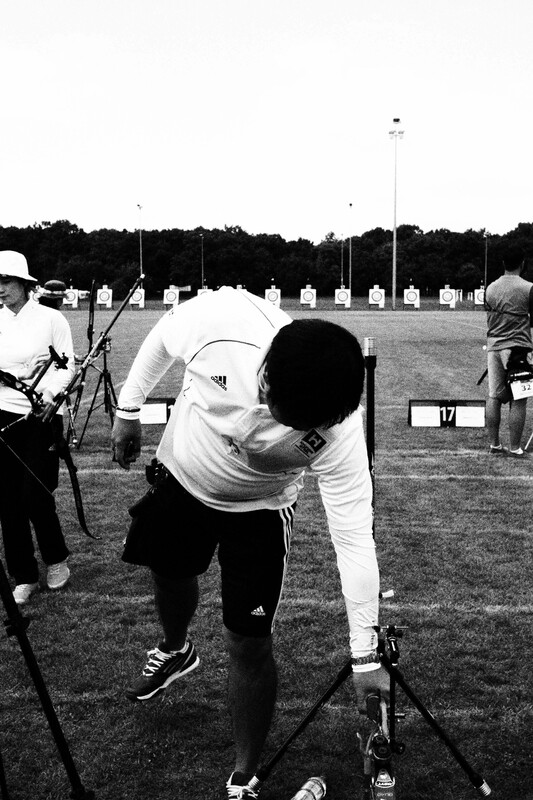 I wander over to the practice field, which is heaving with archers of all hues, including, buzzily, all the Koreans.. The women are wearing their ‘coolie’ hats, which look spectacular in the sun. There’s a few archers who are definitely knocked out of every event still practising, though. Heads down. The Australian squad have changed into denim shorts. Lee Seungyun, the youngest Korean on the men’s team, shows me his tab, with interesting trimming and an extended reference-y bit on it reaching back past his wrist, a classic bit of Korean arcana. People are busy. 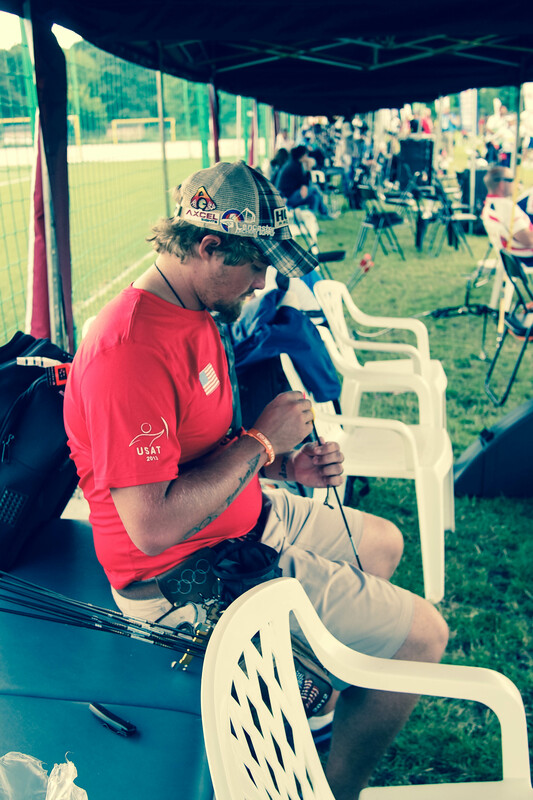 Today is the compound eliminations followed by the recurve and compound eliminations to the semi-final. It’s a long day. 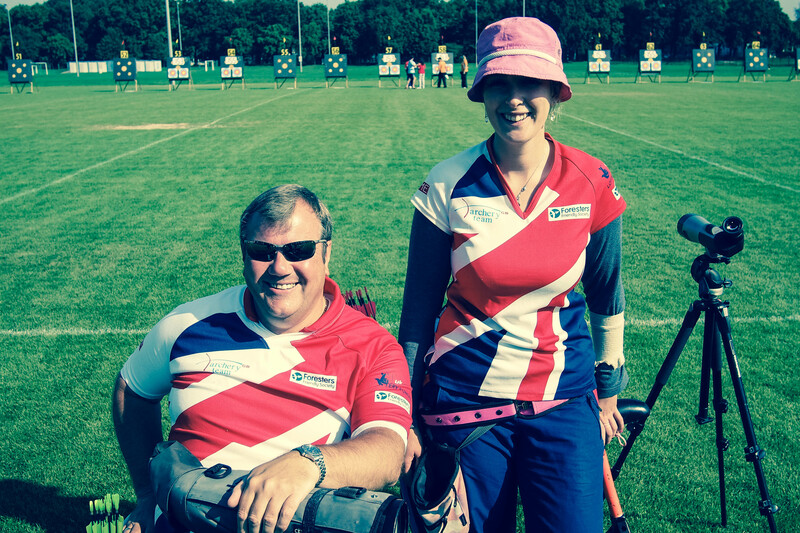 Both John Stubbs and Danielle Brown, two of the UK’s finest para-athletes, make it through the compound eliminations. I tweeted this picture of them which I took almost immediately after they had been knocked out of the team event. That’s British spirit for you. This leaves four Team GB athletes including Naomi Folkard and Alan Wills in the running for an individual place as I wander out for lunch into the suburbs of Wrocław. On the corner of this bright field, awash with carbon and nylon and hope and misery, there is a curious cave-like and silent pub, brown wood and darkness, which serves lunch and perfect Polish beer, tart and tall and very very cold in this sunshine. I’m the only one there. There’s no drinking going on at all, what with alcohol being a banned drug under international rules. When I get back the mood of the whole field has shifted, this being the final stage of individual eliminations. There’s a tension in the air, a sense of worry. 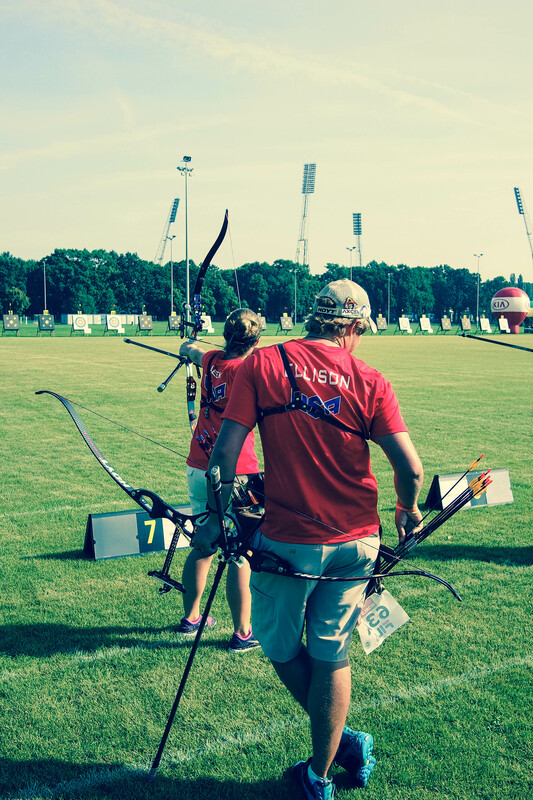 If you’ve never seen an archery tournament before, this is how it works. 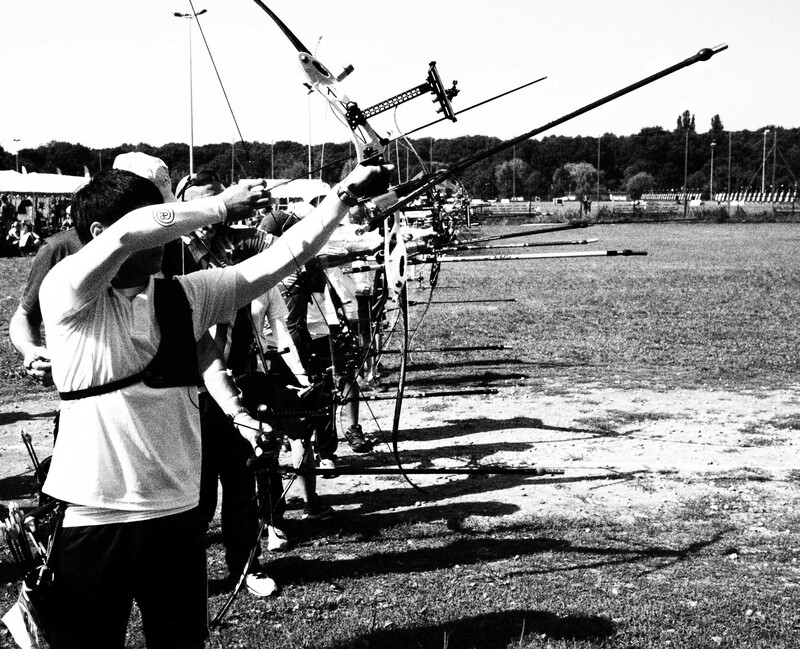 There are strict lines across the field, only the archers may stand astride the ‘shooting line’ when called by the clock, their coaches must stand behind the ‘equipment line’ a few metres behind. I am allowed, for some reason, onto the ‘photo line’ in the no man’s land between the two. The coaches usually stand with their eye pressed to a small scope trained on the target; most archers cannot see what they have scored at seventy metres. Some coaches bark, some suggest adjustments, some just give thumbs up and moral support as necessary, plus clock countdowns if the time is ticking. All the Korean coaches look and act like particularly strict nineteenth century schoolmasters. It’s the way. Most squads have to share coaches. Team GB have one between six recurvers. The Koreans have one coach each. This tiny nation has long been dominant in international recurve archery, and took three out of the four gold medals at London 2012. There are myriad reasons why, but one that is increasingly clear to me is that they just work much, much harder than everyone else. Teams which have started working just as hard have started achieving similar results. People are tweeting me to take pictures of their bow handles, trying to find out the secrets. Taking a Korean scalp in an international tournament remains an achievement that will gain you respect in this world like nothing else. The other athletes are even proud just to shoot against them. One of the problems with the sport at this level is that the performances often come down to one or two arrows. One or two, of the hundreds of thousands an international archer will release over his or her career. A head to head round at the Olympics might be over in six minutes, a little longer here. You have spent tens of thousands of hours perfecting the art to focus it all on this point, and pray that you are not found wanting. Or worse; that the wind will blow away your hopes like the djinns. Luck. One or two ‘bad’ arrows, to sink the ship you have been sailing for years. You can see the fear in people’s faces. With the apparent exception of the perpetually smiling and apparently talismanic Aida Roman, who greets almost every passer-by on the field with joy, there isn’t much sense of play. Finally, the field is allowed to shoot a couple of ends of practice arrows at the competition targets. A sense of relief. The waiting is worst. Unfortunately, all four Team GB athletes get canned in the 1/16. John Stubbs goes out to Choi Yong Hee of guess-where. I leave ‘Stubbsy’ ten minutes after his match, and bound up to him as he is packing up and try and ask him some questions. I never learn. To my surprise, he answers my “How did it feel?” somewhat differently from the recurve team. Straight back at me, he says: “I’m proud of myself, to be honest. I could have just turned up and been rolled over. Hopefully people will take note of disabled people and realise it’s a level playing field. I’ve been doing this since 1997 and it’s my first World Cup.” What a guy. I end up having a lengthy chat with Stubbsy, Becky Martin and a member of the staff whose name I forget about why recurvers should practice with compounders, expensive bowstands, Korean archery bootcamps, bow finishes, the hierarchy of hotels (guess who is in the best one), Pringle flavours and much else. Only the GB women’s team are left in it now. The whole squad will have to sit in Poland for the next three days regardless. That’s gotta be a drag. Loved ones and jobs be damned. You’re stuck here watching other people shoot for the medals. 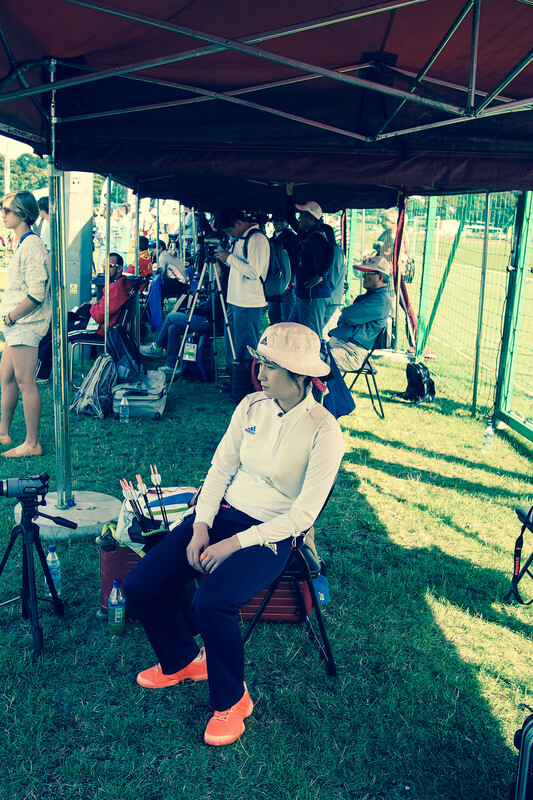 I watch Ki Bo Bae’s second match against Ksenia Perova of Russia, when Ki is shooting next to Oh Jin-Hyek. They were a couple last time I checked. Neither of them even look at each other once in two whole matches. Not once. I am assuming that means they’ve split up, and presumably badly (or they’ve had a massive row, at least). She wins, entirely as expected and immediately sits down looking like someone has just shot her dog. It’s tough at the top. The accompanying music on the field today has gone from a bit weird to palpably insane. During the individual 1/8 the ‘DJ’ plays between ends a bagpipe version of Robbie Williams’ Let Me Entertain You. The staggering display of world class talent that is the recurve semi-final, in glorious dipping sunshine, the beautiful pings and rolls and arrows arcing across the sky is done to the tinkling background of the ghastly Locked Out Of Heaven by Bruno Mars, almost, but not quite, completely faded out. I seem to be the only one who has noticed, everyone else is in their own little special interest zone. The worst kind of music as noise; as filler, as aural wallpaper, no thought given. Music could be used differently as a cue for spectators and archers alike, as a mood setter, as something to create an experience unlike going into the bloody supermarket. 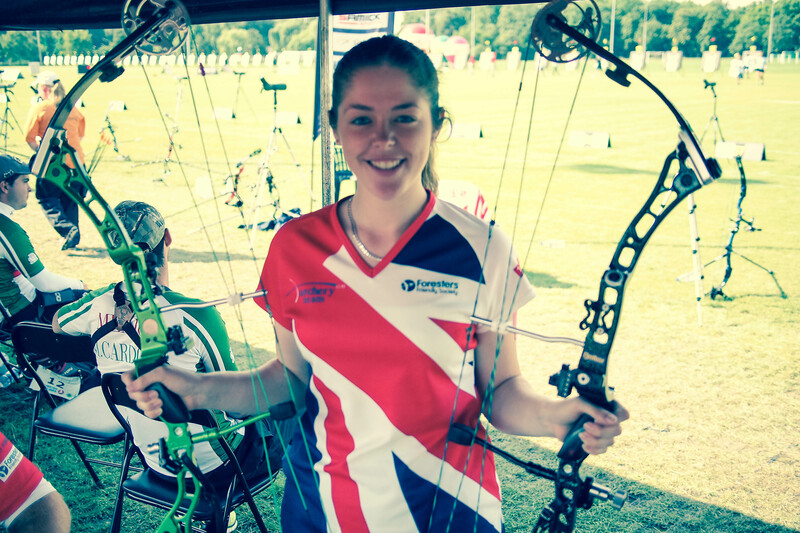 This was one of the most jarring aspects of the competition for me; if World Archery want the sport to expand, gain more exposure and sponsors and spectators, this is something I think needs addressing. I mean, they could start very simply. You know, by not playing a bagpipe version of Robbie Williams’ Let Me Entertain You. The sun gleams brighter and lower. I can feel it on the back of my neck. 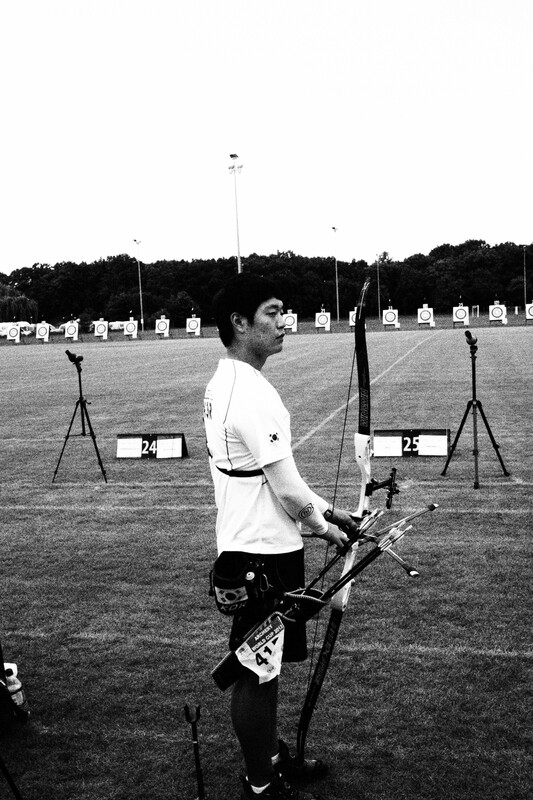 There’s less and less people on the recurve field and more and more of them are Korean. 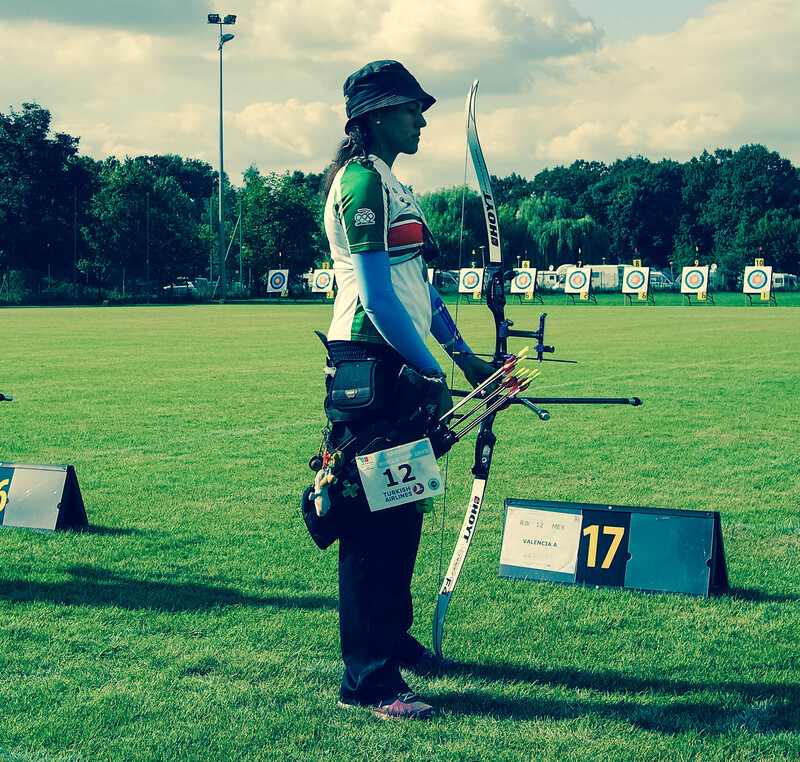 Eventually only Alejandra Valencia spoils the party by winning a shoot off – seven out of the last eight recurve archers in the semi-finals are Korean, including all the men. You can feel a slight collective sigh at the return of the script for the denouement. It didn’t have to be this way, but it is. But Alejandra is fantastic. Electric. Her shot cycle seems to draw up power from the centre of the earth. Nothing is wasted. It all goes down the range. She feels the fear and does it anyway. There is a serenity about her work to an outside observer, although God knows what is churning inside. She is as inspiring as she is inspired. More than ever today, archers looked lonely out on the field. Difficult. Afraid. Fearing themselves and their own abilities. 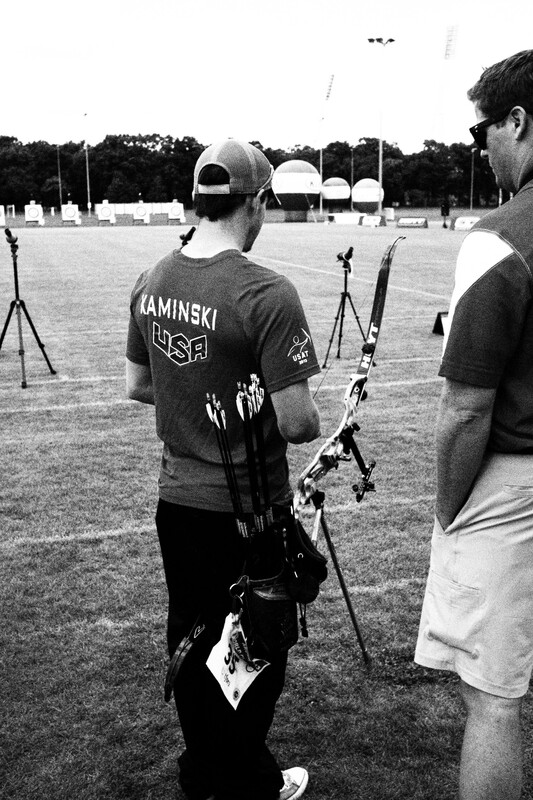 In the men’s compound, astonishingly, three men have shot a perfect round of 150. Fifteen arrows all landing in the ten ring at fifty metres. Sergio Pagni of Italy and Dominique Genet of France both have 150, and have to shoot off for a place in the final. Genet goes first. He looks through his scope, and gives an utterly Gallic shrug. It’s a ten, but Sergio’s ten is nearer, and twenty Italians roar. Pagni is in yet another final, and cements his position as one of the greatest compound archers of all time, whereas Genet becomes the first archer in history to lose a match despite shooting nothing but tens. 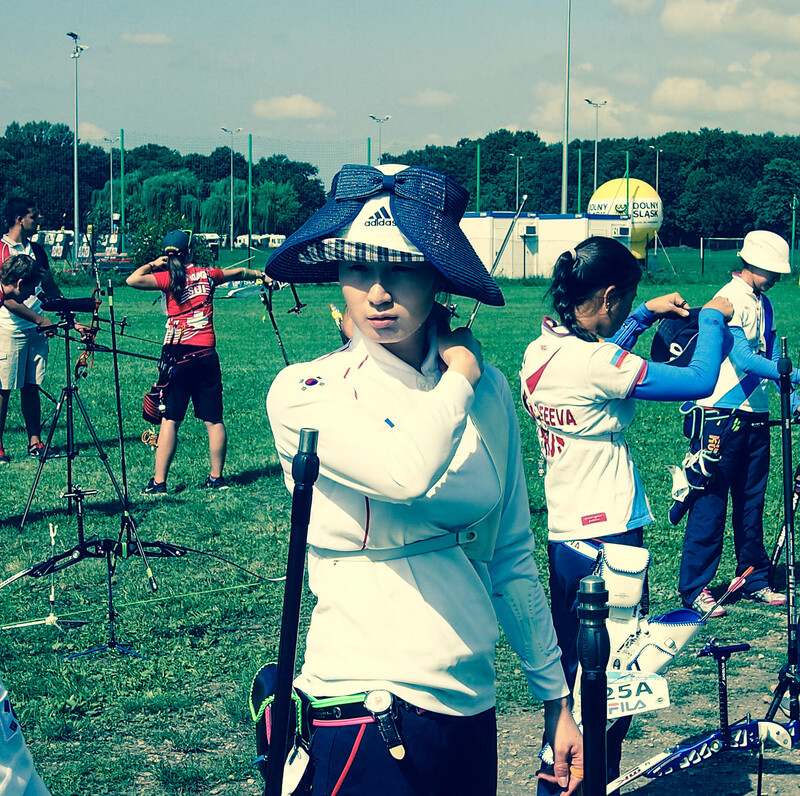 The 150 rounds are becoming more frequent at international competitions. Perfection is the new standard. Ki Bo Bae and Ok Hee Yun will face off for the women’s gold on Sunday, and Jae Wang-Jin and Lee Seung-Yun for the men’s. 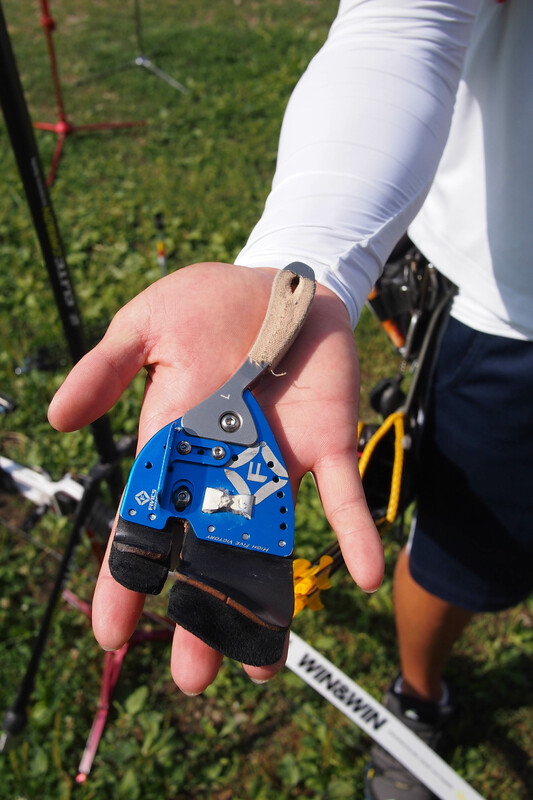 In recurve archery, many nations have tried, but all but one have failed. The relentless effectiveness of the Korean recurve machine, notorious for 1000-arrow-a-day practice routines, has been proven again in spades*. Practice out your fear. Practice away the djinns. Eliminate your fragile self from the doing, the execution. If you can. More detailed news here. Live scores here. Finals this weekend. Special thanks to Maciej Laba. Even more pictures at www.facebook.com/theinfinitecurve Give me a like if you like.